I was born in Northern California, two weeks late, in October of 1979. Both my parents contained an unknown gene that was passed on to me which resulted in being born with a genetic disorder called epidermolysis bullosa (EB for short because just try saying it once! ).The doctor's told my parents the likelihood of me walking was slim, having a normal life impossible and of me reaching adulthood not very likely. They took me home after two weeks in the hospital. I started walking when I was two. I started kindergarten two months shy of five years old and was forever in love with learning. I was not able to play sports like most kids so I read, and imagined, I sang and danced and acted. My parents divorced when I was in second grade. My dad and I moved to the big city near us and we lived with my grandparents. My mom got remarried and I have a stepdad and a sister 9 years younger than me and a brother 13 years younger than me. We moved back to the suburbs when I was 12 where I finished middle school and attended high school. I went through surgeries yearly. My family always led me to believe I had a normal life, my challenges were just different than other peoples. I excelled at school, I got leads in musical theater and I enjoyed all different friendships. I graduated High School with awards. I went to college with no idea what I wanted to do, but while I was there I enjoyed having a social life because I realized life could change at any moment, I have lost a lot of friends to my disorder. I graduated college with a degree in fashion design but never really went into it. Two or three years later I applied to graduate school for art therapy and marriage and family therapy. I wanted to help kids like me, I worked with them at summer camps but wanted to do more. Halfway through my final year I was diagnosed with cancer, something inevitable with my disorder, after five months I was clear, I went back to school and finished my thesis, I graduated, achieving one of three academic awards in my department. I love helping, listening and teaching. I'm sure I've gone past 250 words, but I think that sums it up as succinctly as possible! And please no one pity me or feel sorry for me, especially if you look up what I have, my life has been good despite all the difficulties. 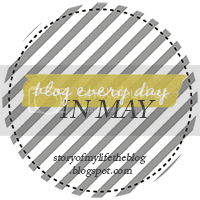 Want to join me in 31 days of blogging? I immediately looked up the condition but I refuse to feel sorry for you! We're all dealt our fair share of difficulties and you've made the best of them and succeeded. IT's so interesting getting to know the bloggers behind the blogs - I would never have guessed at the difficulties you've faced otherwise and I commend you for pulling through!